The year is 1841 and Grayson Sherbrooke, a popular author of gothic paranormal mysteries, lives on the coast of Northern England with his 4-year-old-son, Pip. He''s asked by a neighboring little girl, P.C., to come to Wolffe Hall because something terrible is threatening her and her mother. She''s come to Grayson because she''s confused him with his fictional hero, Thomas Straithmore, who overcomes all obstacles and always triumphs over otherworldly evil. Thus, to her mind, Thomas is the only one to save them. She describes the house shaking with terrifying tremors and a huge black hole she calls the Abyss appearing in the entrance hall. She also knows the menace involves her great grandfather, known as The Great. He''s obsessed with collecting and returning the famous Waterloo medals to the soldiers of the great battle of 1815, but he refuses to tell anyone why he''s doing it. Grayson is soon embroiled in a mystery involving a wrongful death on the battlefield at Waterloo and a paranormal force that threatens the very lives of those living in Wolffe Hall. 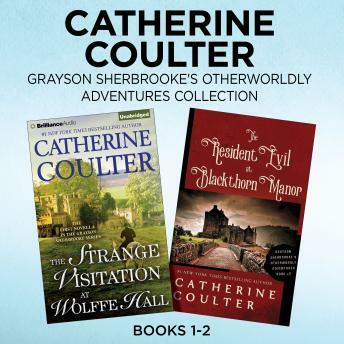 In Grayson Sherbrooke's second Otherworldly Adventure, he goes to Scotland to Vere Castle, the home of his aunt and uncle, the Earl and Countess of Ashburnam. His aunt Sinjun had written to him that her resident ghost, Pearlin' Jane, warned that evil was coming. But Grayson doesn't make it to Vere Castle. He's stopped by a mysterious carriage, a beautiful white hand extends to him, he touches it and he's gone. When he comes to himself, he has no memory of the missing day. Pearlin' Jane (see The Heiress Bride) warns him that Lady Blackthorn isn't what everyone believes she is, she's something beyond this world. Then he remembers what happened to him that lost day and knows it isn't trouble that lurks, it's evil.